The field of clinical research has for a long time been underdeveloped and significantly fragmented, limiting its ability to provide optimal services and solutions to the healthcare industry. There have been continued calls to improve the quality and effectiveness of clinical trials through sharper focus and use of real-time results from patients and providers. To facilitate sharper focus and ensure real-time review of evidence and results there is a need for enhanced consent management of rights to own, share and use data in clinical trials. Recent developments and projects have shown the propensity of the blockchain platform to be used as a platform for consent management. This article seeks to examine some of the critical challenges in the consent management of clinical trials and the possible blockchain solutions. Generally, patient consent involves informing patients of all the steps and process involved in clinical trials and their associated risks. The clinical trial process undergoes four major phases of consent. The first phase incorporates the assessment of a drug or equipment to determine its effect on the human body. This process usually involves a sizeable population of between 20 and 100 volunteers. The second phase utilizes randomized trial whereby groups of people are placed under observation to determine the efficacy of a treatment. Phase three of clinical trials involves large-scale testing where several hundred and thousands of patients are closely examined. The effectiveness and side-effects of a drug or device are largely reviewed in this phase. Once successful, a drug or device can now be approved by the Food and Drug Administration(FDA) for marketing. Phase four involves Post-marketing surveillance whereby a drug is evaluated against alternative drugs to monitor its effectiveness. One of the major challenges with clinical trial is getting people to consent their data for trials. Most people are usually wary of providing their medical data for analysis. The reluctance to participates can often be as a result of fear of data misuse, mistrust, or lack of reliable platforms to participate. In fact, a study by the FDA indicates that a 90'% of participants in clinical trials are those who have been affected by a disease or those who have a close friend or relative affected. Another challenge is on consent management. Numerous clinical trials have continuously been accused of misusing client consent by sharing patient data with unauthorized entities or using it for the wrong purposes. Today patients have little to no control over how their data is used and shared amongst researchers and clinical trials since it is mostly owned by large pharmaceuticals and medical institutions. Another challenge of consent management in clinical trials is in distribution and security. Over the recent past, medical records and data have grown to become one of the most highly prized assets by hackers. Patients are normally wary of how their data is stored and distributed. 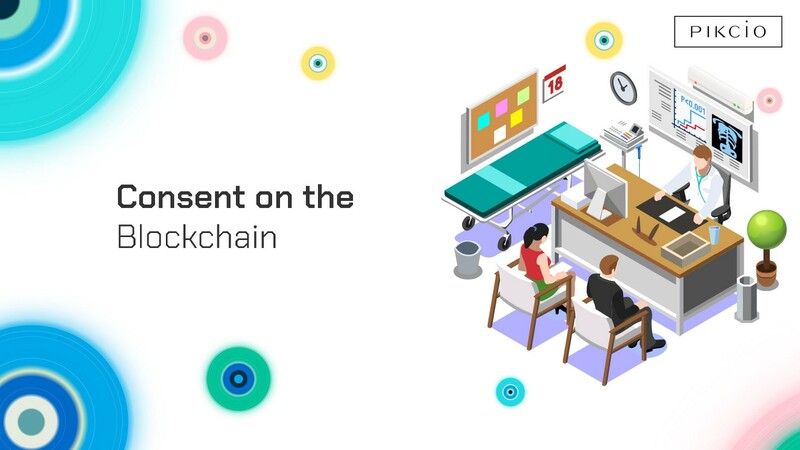 The blockchain network can be used to implement protocols that allow collection of consent from patients and further storing and tracking the consent on an immutable ledger. This can be accomplished by building a consent work-flow that timestamps each patient consent on the blockchain. The consent is archived through cryptographic encryptions and hence it is virtually impossible to falsify or alter the consent. The consent work-flows can be further enhanced by smart contracts which ensure that the trials fulfill certain conditions before consent is approved. The decentralized nature of the blockchain network allows it to be utilized for reproducibility and data sharing. The platform enhanced security measures also ensures that privacy concerns are alleviated and hence more people are free to share their data. Blockchain tokens may also provide incentives for patients to offer their consent on clinical trials. Perhaps, one of the most notable instances of patient consent management in clinical trials is a proof of concept done in a France hospital by Benchoufi and Ravaud. The team developed a consent documentation platform on Bitcoin’s blockchain. Verification only applies for patient consent registration only if it is linked to a patient’s unique signatures. Over and above the blockchain networks continues to demonstrate its potential for application in the healthcare industry. The clinical research and patient consent are one of the fields that technology is capable of providing immense transformation. The blockchain is not only capable of streamlining the concept process but can also aid in promoting patient consent in clinical trials.